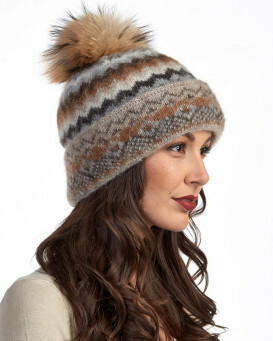 The trendy style of our Slouchy Icelandic Knit Wool Beanie with Finn Raccoon Pom Pom for women is crafted with a fleece interior headband to ensure you do not feel any discomfort or itchiness. 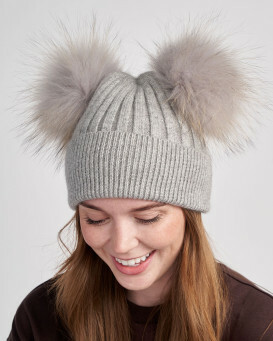 A large Finn raccoon pom pom is lush for a fashionable effect. This lightweight and comfy style is designed with a 100% Icelandic knit wool shell for a breathable accessory. The unlined appeal makes this gorgeous cap one size fits all. 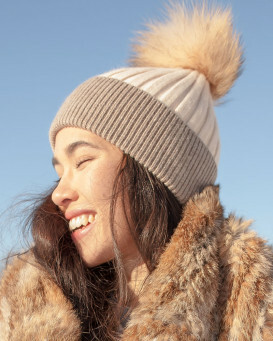 Great for taking wintry walks, our Slouchy Icelandic Knit Wool Beanie with Finn Raccoon Pom Pom will definitely be your new best friend this chilly season. "Furrrtastic. The hat arrived today and in perfect condition. The hat is exactly as displayed on your home page. My wife loves it. It will match her crystal fox stoller perfectly. Thank you very much and we look forward to buying other products from you." "My wife loves her new beanie. It fits very well and was in perfect condition. We will being recurring customers fur sure." 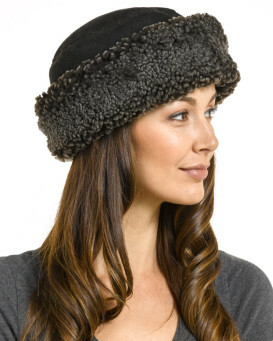 "Beautiful hat with a large pom pom. It is warm and looks like on the picture. Shipping was fast."